Josh Gad echoed a thought running through my head when it was announced that the working title for the Frozen animated sequel was…Frozen 2. John Lassiter had told the crowd at D23 Expo that titles are perhaps the most difficult part of movie making. But considering the complete lack of originality in some of their upcoming releases, Josh’s comment rang true. Recent releases like Cars 3, and the upcoming Incredibles 2, Toy Story 4, and Frozen 2 are indicative of this. But to be fair, most sequels do have original titles like Finding Dory or the upcoming Ralph Breaks the Internet: Wreck-It-Ralph 2. Still the future of Disney animation seems to lie in sequels. The upcoming roster of films feature many of our favorites coming back once again – or in the case of Toy Story for a fourth time. I don’t think that’s a commentary on a lack of originality on the part of Disney but rather the preference of our times. In an era of TV binge watching and Marvel Cinematic Universe building, people want to develop attachments to characters over a long period of time. They take comfort in diving back in and discovering new corners of stories they already love. Which is why I think Disney is going back to the well so often. Sequels were never a hallmark of Disney Animation. It wasn’t until 1990’s Rescuers Down Under that one even existed and still the company seems to dole them out pretty sparingly – until now. Of the next six animated features, four are sequels. But they seem to be some pretty darn good sequels. John Lassiter came out with a t-shirt gun to start things off. You know it’s going to be fun when they start firing a t-shirt gun at the beginning. 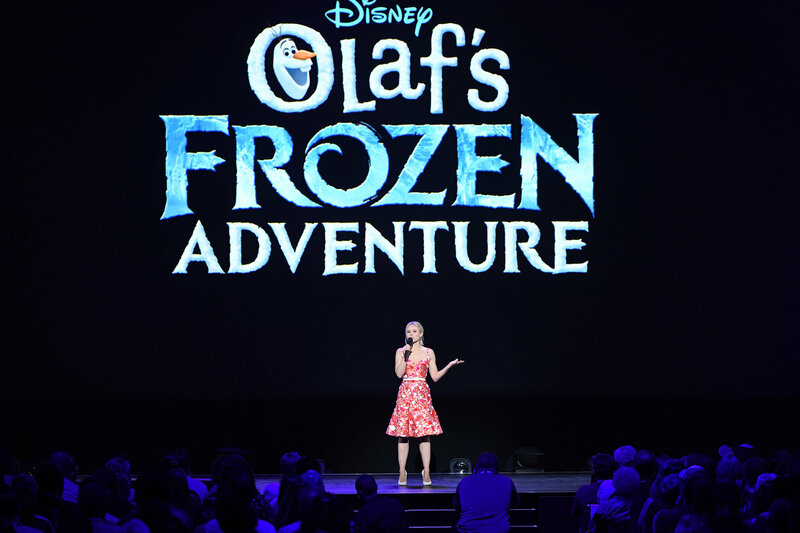 With the help of Kristen Bell they started to talk about Olaf’s Frozen Adventure the animated short that will debut before Coco. 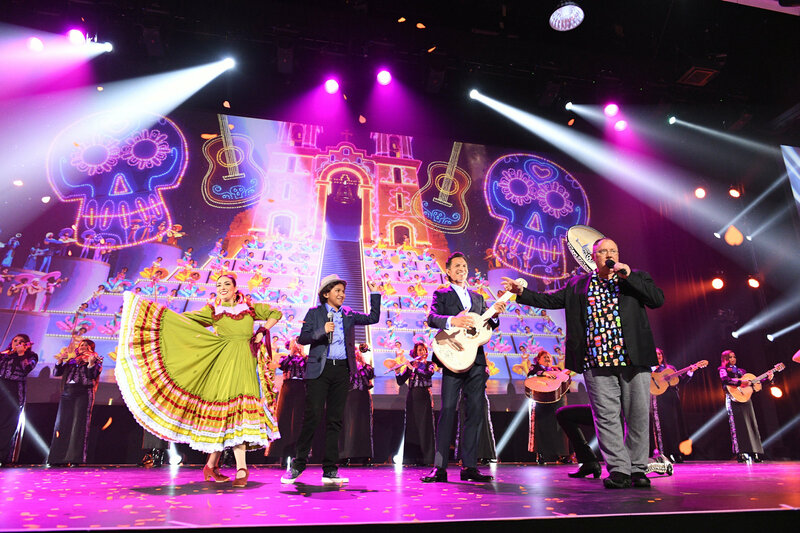 After the preview seemed to fail suddenly, Josh Gad came out to surprise the audience and SANG an original song from the film LIVE to the animation screening behind him. After some very witty and funny repartee between John, Kristen, and Josh, they announced work was being done on a Frozen sequel tentatively titled Frozen 2. John made a (funny) point to share what the film would NOT be called including about a dozen plays on the word “frozen” like Frozen Assets. And said it would definitely not be called Thawed. My favorite announcement was for Ralph Breaks the Internet. First we got to see an hilarious preview of a scene between Vanellope and the Disney Princesses (my favorite part was when they pointed to Merida and said, “She’s from the OTHER studio”). But then the actors who voiced the princesses themselves came out on stage. 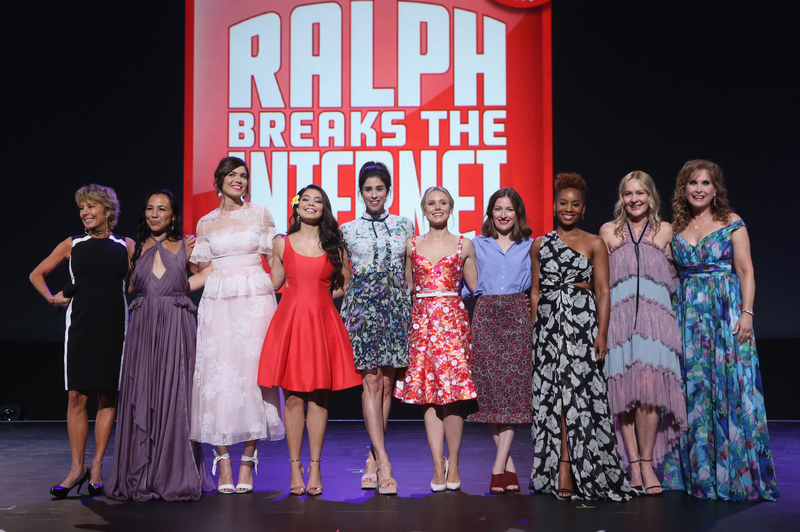 Every living princess (except for Ming Na Wen and Idina Menzel) were present and they welcomed the newest princess into their fold – Vanellope Von Schweetz! It felt like being in the presence of Disney royalty. All of them voiced their characters for the film, too. It’s great to see Disney not only poke fun at themselves but do it in such a grand way. Incredibles 2 is coming out! 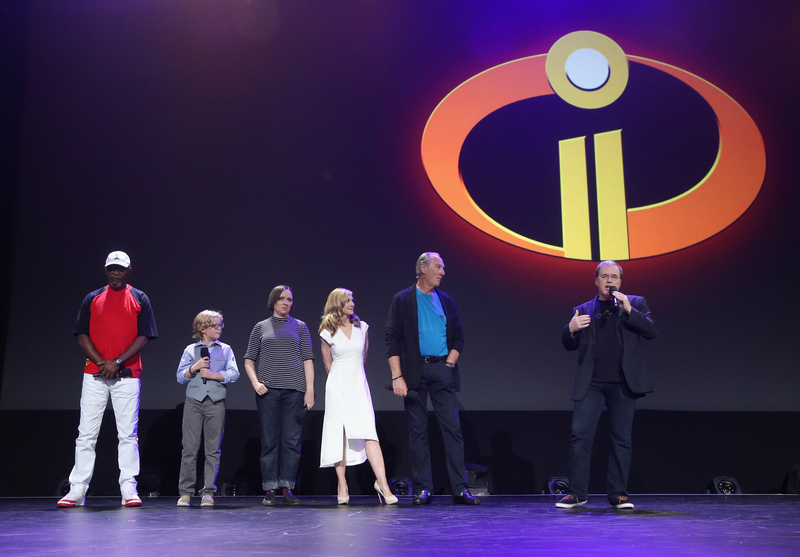 Brad Bird, the director of the first AND second shared a brief overview and a few looks at some storyboards for the new movie. We know it will focus on the new family dynamics now that Jack Jack has powers and will feature Mrs. Incredible taking on the bulk of the action (which seems very cool). He also showed a rough animation clip of Mr. Incredible finding out Jack Jack’s powers which was cute and funny (if not making me question Mr. Incredible’s parenting skills). And the crowd rose to thunderous applause when Samuel L. Jackson came out with the rest of the cast to talk about reprising their roles. Only one cast member had to be replaced – Dash. Since filming for the sequel was so many years after the original, director Brad Bird said they would either have to explain why suddenly Dash’s voice got so deep or find someone to represent a younger Dash. As for the rest, we had a brief introduction to Toy Story 4 which is to say really not at all. No new information came out at D23 Expo about the film other than John wasn’t directing it any longer. Another movie, currently unnamed, is also coming out about planes in space. It was unclear whether or not it officially is a Planes sequel but features military vehicles this time. The short sequence we saw had F-14 Tomcats and a SR-71 Blackbird in it. A second unnamed animated feature is about non-humans trying to discover the truth about their father. Because both films are still in development, they didn’t share much except to let us know they exist. Interestingly, nothing new was said about Gigantic. I wasn’t expecting to hear a dissertation about what went wrong with this film, but getting moved over and over doesn’t portend well for it. Everything closed with Coco. Disney interestingly seems to be relying more on the appeal of Olaf’s Frozen Adventure than this Day of the Dead tale by itself. Personally, I’m happy to see a film featuring an all ethnic cast coming out from Disney. They have increasingly worked on diversifying not only their stories but the people who create them, but another Day of the Dead animated film? The Book of Life came out just three years ago. Couldn’t there have been another aspect of Hispanic culture that could have been celebrated? Will people come out for another similar film? Granted without seeing the final product it could very well be different or even better, but admittedly, I’m not a big fan of skeletons. They kind of creep me out. And why the name Coco? Unless it’s a big reveal like “Rosebud” in Citizen Kane, I’m not sure why Disney hasn’t played up the reason for the title in any of the trailers. The boy is named Miguel, the dad is named Ernesto, and the dog is named Dante. Who’s Coco? (Apparently it’s the name of Miguel’s great-grandmother who is a major figure in the film). It’s still a ways away until November so I’m willing to hold off speculation until after it comes out, but I’m hoping for the best. The overall presentation was impressive and got me even more excited overall for what’s coming up. The next couple of years look to be banner years for animation. Can they top the hit parade they’ve already had? Time will tell. For more on my D23 Expo adventures, read my A Sorcerer’s Journey series.